Black and white, a classic color combination that never bores me. I had the idea for this tape pattern for a while. With my first attempt to create the mani, the tape strips were too big so it resulted in the Bluesy checkers mani, while it should have been the Bluesy STRIPES mani, you see. So now you're looking at my second attempt, in a black and white combo. 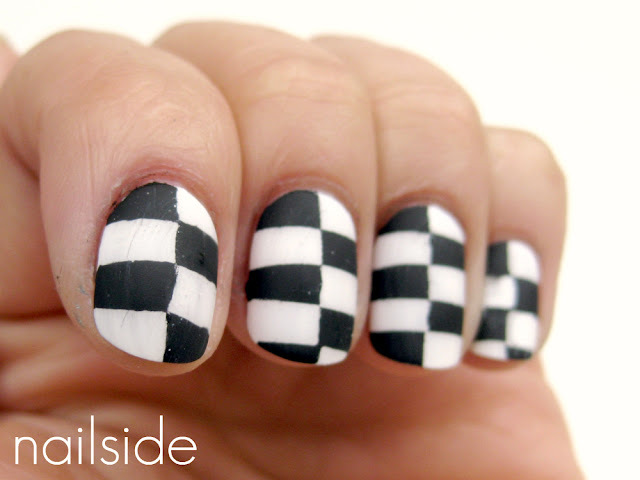 But I'll put this mani under the label 'Checkers' as well, 'cause to some people it probably still looks like checkers, lol. Polishes I used are Essence Stamp Me! White and a nameless black creme. The matte topcoat is also Essence's. Are you a fan of black and white as well? Good night! Very cool! :) It reminds me of racing flags! I actually think of racing flags at the first glimpse too! :) Awesome! I love black and white! This almost makes me dizzy if I look at it too long, haha. Love it.